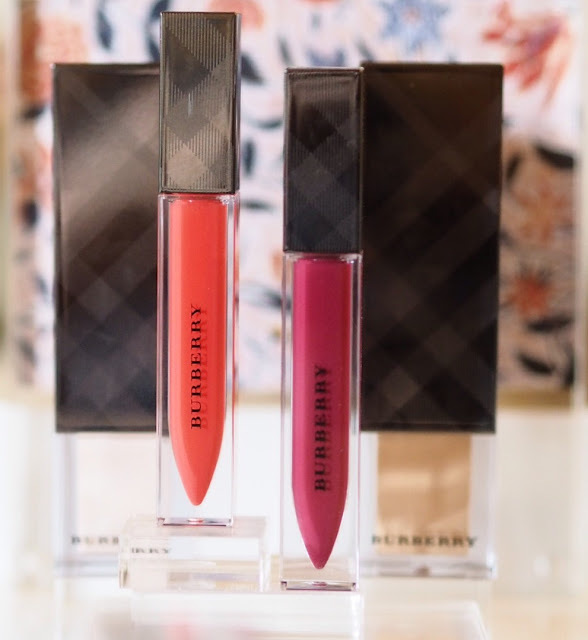 There’s no joy much more fun than a brand new lipgloss, and, as I love a bit of Burberry, and a bit of lipgloss, so when a couple of them were included in a recent delivery from the now-iconic British brand, I was happy indeed. 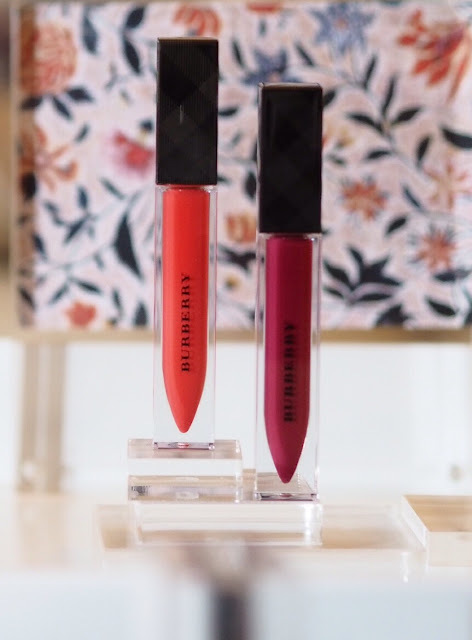 The perspex tubes that make the glosses look like test tubes, and the lovely pewter packaging all add up to a lovely package, and these two new shades, Tangerine (No.77) and Plum Pink (No.97) are both lovely too. Tangerine is a hot orange that looks almost neon in the tube. I like the shade a lot, as many orange lip colours have a lot of white in them, which make them difficult to wear, but this is a relatively clear shade, and one that’s easier to wear than you might expect from the tube. Plum Pink is a lovely deep pink with a hint of blue. 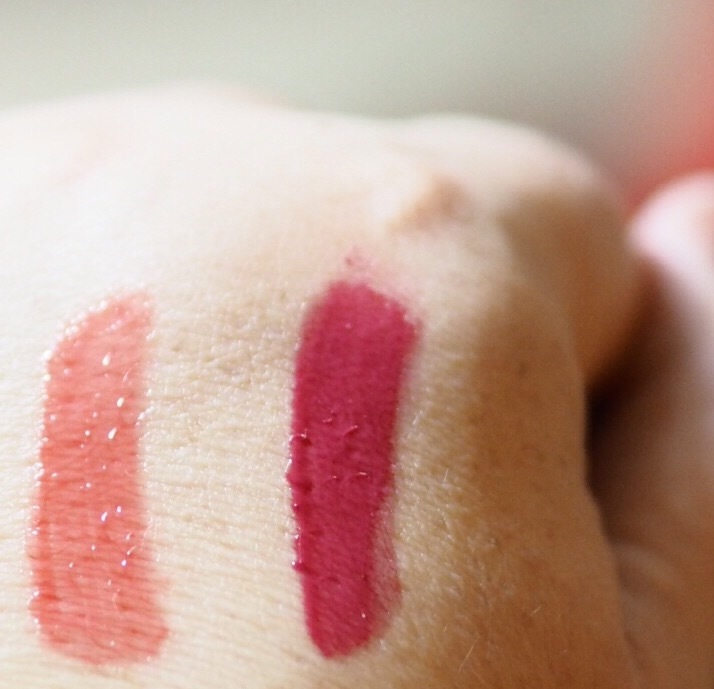 As you can see, Tangerine on the left there is quite sheer, and subtle on swatching, whereas Plum Pink, on the right is slightly more opaque. On my lips, Tangerine is very subtle indeed, which surprised me as it is so vibrant in the tube, but I actually like that it’s so sheer as it makes it very easy to wear. It’s a nice, glossy formula that slicks on easily, unscented and unsticky. Here you can see Plum Pink has more pigment, and is again a more wearable shade on the lips than you might expect from the tube, lending a berry-ish brightness to my lips, which I really like, and is ideal for the more autumnish weather we’ve been having this … year. More from the Burberry Autumn 2015 collection later this week, but you can find the Burberry Kisses Gloss in store now, and they cost £21 each.